When he left his position as chief strategy officer at The Active Network (the company he sold startup Thriva to for $60 million in 2007), Matt Ehrlichman promised his wife they would start building their dream home. Like many homeowners before them, they longed for a centralized place to find the best professionals. “I saw no reason that it should be hard to see what professionals were available, and to pick the right one for the job,” Ehrlichman says. 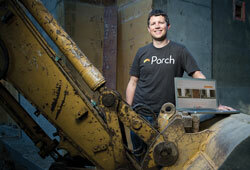 Ehrlichman founded Porch.com to address this challenge. Porch is a visually driven website that uses public and private data to help homeowners connect with resources for remodels and new construction. The information is collected from more than 1.4 million professionals and some 60 million projects, and may include permitting documents and a contractor’s project history. The free service aims to make home improvement easy by providing homeowners insight into price, aesthetics and customer satisfaction on projects in their own neighborhoods. Porch.com combines written customer recommendations and one-click endorsements for certain skills, like plumbing and cabinetry work. Businesses can upload photos and the costs of previous work on their own profiles to showcase projects they’re proud of. Profiles are always available to businesses and individuals free of charge; an upgraded “Partner” profile is available to businesses for $35 per month. Some of the upgrade features include increased opportunities for homeowner connection, being featured in “Best Of” lists, homeowner newsletters and being prioritized in project browsing. The Seattle-based company has 20 employees and a $6.25 million seed round, approximately six times the typical seed funding for startups. What makes Porch truly distinct from other consumer review sites is the amount of detail and data available, Ehrlichman says. For example, Porch has identified 250 home improvement, maintenance and repair categories to ensure that it is the go-to source for home improvement insight. Beta access to Porch.com is now available. Porch plans to go live this fall.